I first noticed this place out on a bike ride, it caught my eye but when you’re scooting by on two wheels you don’t dare look at anything but the road for long. Sailing by the building struck me as though we had made a wrong turn onto a movie set for a Western. A full porch runs down the front with a veranda above. The lettering in the windows is gold leaf and everything has an antique feel to it. 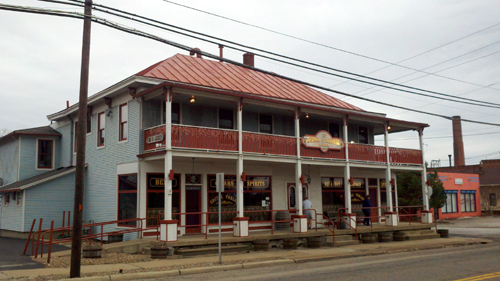 It wasn’t until I was reading the back of the menu I learned the building is a renovated 1858 Stagecoach stop. The menu is also what I would imagine being served in the same Western, alcohol and beef. There are other options on the menu but steak is certainly the feature. Inside the doors the motif continues with lots of wood but with many more amenities than were likely available in the 1800’s. The server did a nice job through the evening and started by suggesting some new craft beers they had just added to the menu. I wasn’t interested until she mentioned a Kentucky Bourbon Barrel Ale. 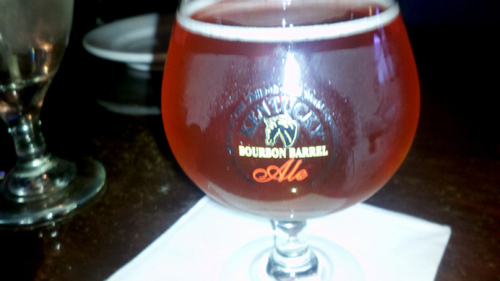 The ale is aged in decanted Kentucky Bourbon barrels for weeks giving it a vanilla and smoky oak tone. Super tasty…if you’re into that sort of thing. There was a unique sounding appetizer on the special board, lobster sliders. Why not? 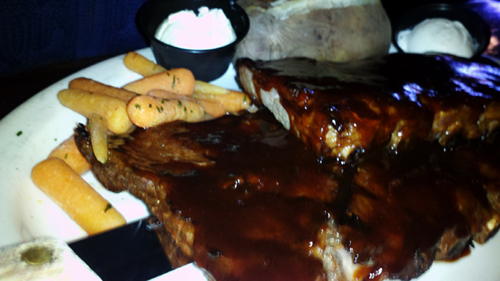 We also ordered a steak…Big Surprise…and the ribs. The sliders arrived first. Man, they looked good; but they were plagued by a single but disastrous error. The brioche rolls were perfect. The arugala was dressed with a lightly sweetened sesame dressing, all of that was perfect. The problem was the lobster cakes. As with most shellfish lobster has a very mild flavor, which would likely have been delicious with the greens and rolls. The cakes though were loaded with a curry like spice that drowned any actual lobster. 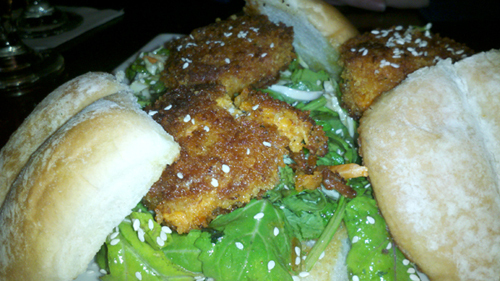 For all I know, there was likely less lobster in the sliders than beef at a particular taco purveyor. They weren’t bad necessarily; they just failed miserably to live up to what the name suggested. Salads and rolls arrived at the table next. 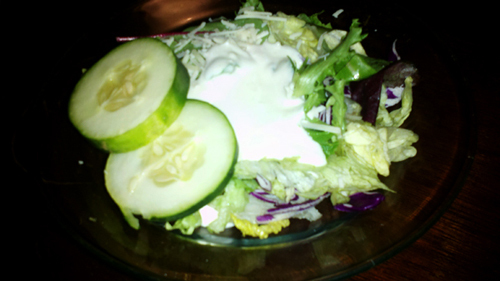 The salad looked really sparse but it turns out the bowl is deceptively deeper than it appears. The bread was warm and we were feeling a little better about dinner. We had caught a snippet of a show about ribs earlier in the day and Steph was ready to go. The ribs were relatively tender but meaty and coated with an average sauce. They won’t win Best in the West or Memphis in May but they did a nice job quenching the rib Jones. I ordered a strip steak and opted for the anniversary special which was smaller but a great deal. I ordered caramelized portabellas but am pretty sure I got the roasted garlic button mushroom demi. Whatever it was the topping was the best part of the dish. Rich and earthy the sauce made the dish. 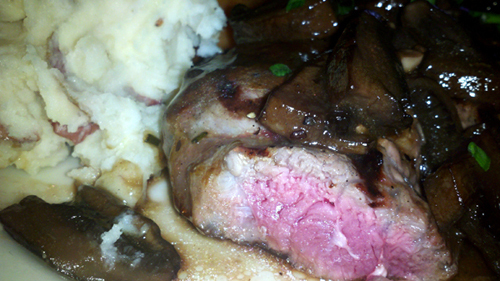 The steak was tender and cooked to perfection but there was not a great deal of steakiness on the palate. 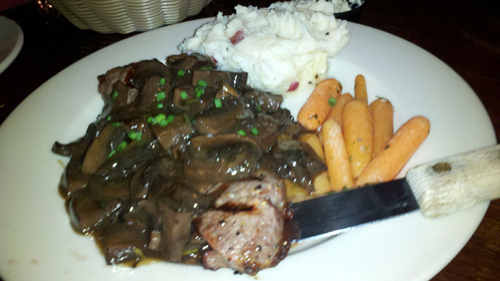 The mash was good and the carrots were carrots, I just wish the steak had a more assertive flavor. The Medina Steakhouse and Saloon has a nice and interesting setting, solid service and some interesting choices on the menu. Not all of which deliver. Kinda a bummer on several levels.